Whether the heroes need a friendly port in which to land their starship or are preparing to embark on a starliner bound for distant worlds, no Game Master wants to spend precious game time drawing every docking clamp and departure gate. Fortunately, with Paizo's latest Starfinder Flip-Mat, you don't have to! This line of gaming maps provides ready-to-use science-fantasy set pieces for the busy Game Master. 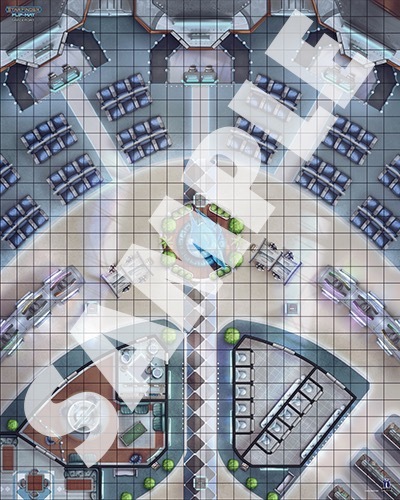 This double-sided map features an expansive docking bay for starships on one side and the shops and services of a public spaceport concourse on the other. Don't waste time sketching when you could be playing. 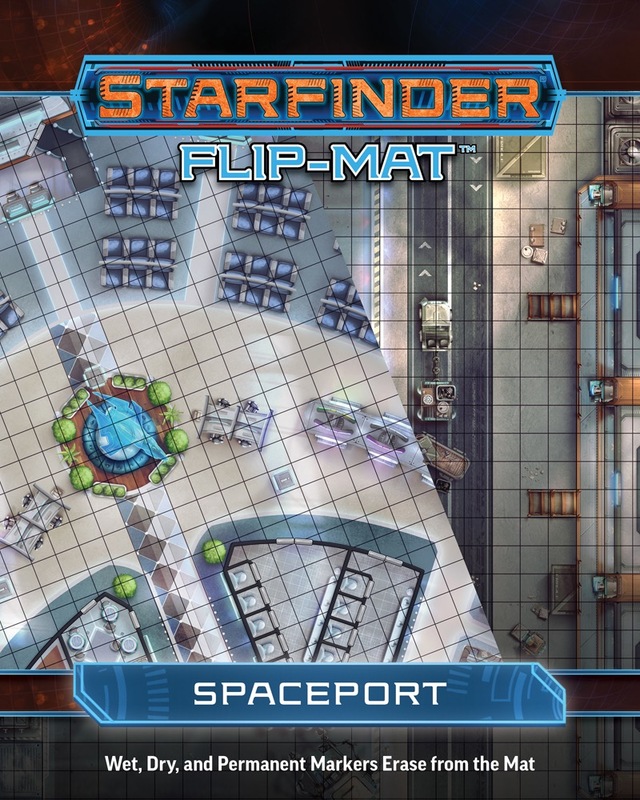 With Starfinder Flip-Mat: Spaceport, you'll be ready the next time your players dock their starship! Is there a page which indicates what the indicative line up of maps is? The 'Spaceport' seems very similar to the 'Space Station' map released a couple of months ago. I thought as a subscriber I was getting a new map with every installment; now it seems I'm getting rehashed versions of maps? As a subscriber it would be nice to see what is planned (accepting that there may be changes as various products go through the design and review process). This is not the real art, but a stand-in from Dead Suns book 5. The actual art should be shown shortly. When they produce maps of a similar genre, Paizo generally try and keep the style consistent (there has been considerable fan support for this, over the years). It means you can move from one map to the other without a jarring change of mood. I’m confident predicting it won’t be a rehash of a previous map. It’ll be fundamentally different in terms of features PCs might interact with, even if drawn in a similar style. 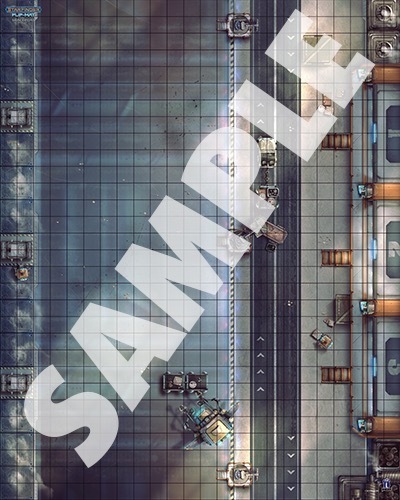 As Marco points out - this isn’t due until May (the map currently shipping is the warship flipmat - full preview available here). Closer to the time they’ll post actual cover art (and usually full previews). If you ever see one coming up that isn’t for you, it just takes an email, phonecall or forum post to customer service and they can cancel your subscription. Once the map you don’t want has shipped, you can then resub with no embarrassment. I'm sorry, but neither is side A an "expansive docking bay" (even for tiny starships), nor is side B very useful for play - it has lots of toilets from the looks of it, but almost no shops. I have to say i am increasingly dissatisfied with the designs of the Starfinder flip-mats. Most of the starship maps are not very useful and a lot of the generic maps - like this - are of very limited use in play. There are exceptions of course, but it is frustrating. -Please make ("bigger" if necessary) maps of the starships from the Core Rulebook and the AP volumes instead of generic ones that are not even fully depicted. The "Sunrise Maiden" was great! -The location maps inside the AP volumes are a lot more useful for (general) play, than most of the ones in this line. Isn't it possible to do them as flip-mats? I love 90% of the "Pathfinder" flip-mats, but it is less than half with the Starfinder ones.